After attending my first ISC West tradeshow in my new role as ADI’s North America President, I thought what better time to share some thoughts with my first ADI blog post. It’s an extremely exciting time to be in the security and low voltage market, and I am really happy to be a part of it. Overall, I think the ISC West show was a huge success and it was personally a great experience for me. With thousands of attendees and more than 100 exhibiting manufacturers, the energy level was high across the show floor. My days were filled with meetings with vendor partners, industry associations, trade publication contacts, and spending time in the ADI booth talking with customers. I was particularly proud of ADI’s two-story booth and the interactive product demonstrations we were showcasing. We had a steady stream of visitors in the booth interested in seeing all the solutions we had on display. Members of our team spent lots of time with dealers helping them learn about our offering in IP video surveillance, access control, intrusion, fire, communications, AV, and more. There were a lot of cool things to see at the show, and so much innovation. By walking the show floor, I saw so many new product introductions from vendors like Assa Abloy, Axis, Arecont, Bosch, Digital Watchdog, Fire-Lite, Hikvision, Interlogix and more. What adds even more excitement is that all these technologies will be available at ADI. Smarthome technology and the connected home was definitely a trend that got a lot of buzz. In the ADI booth, dealers could see and test Z-Wave enabled products for security, lighting controls, locks, thermostats, garage doors, water sensors and window shade controls. 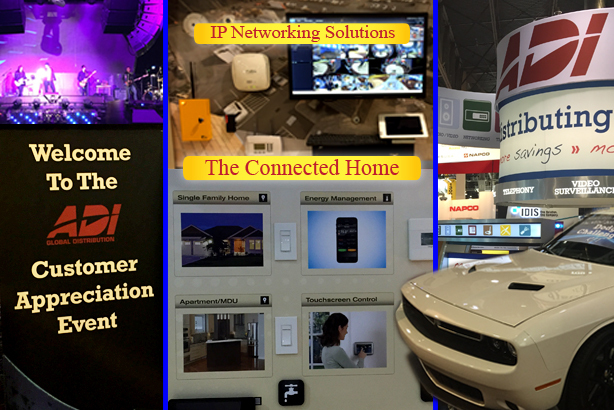 Honeywell Security Group’s redesigned booth featured the new Lyric Smarthome Security System where dealers were able to interact with a self contained home automation platform that offers voice control. ADI sponsored a number of events during the show including the Security Industry Association (SIA) Alarm Industry Research and Education Foundation’s (AIREF) 12th Annual Golf Tournament, and the 20th Annual Security Sales & Integration’s Sales & Marketing (SAMMY) Awards. ADI also joined together with many of our vendors to host a special customer appreciation event to thank dealers for their support. More than 1,300 dealers came out for the event hosted at the Hakkasan Nightclub in the MGM Grand and enjoyed an evening of food, beverages and live musical entertainment from the cover band All Request Live. This really was a fun night for all who attended. Hosting these types of events is just one of the many ways ADI expresses its appreciation to customers. Another exciting thing that was announced during the show was ADI being named North America Distributor of the Year by Arecont Vision. Arecont is an important partner of ADI, and it is an honor to be recognized by them for our focus on delivering first-rate IP solutions to systems integrators and dealers. ISC West and other industry shows provide a great opportunity to learn about the newest technologies, meet face-to-face with manufacturers, and connect with industry peers. The ISC West show was a great experience for me and I’m already looking forward to the next show! Click here to see more industry events where you can find ADI.